Yep, mom and I tried this kamameshi delivery for lunch in my apartment room on May 14th right after coming back from the hospital. It was sooooooooooooo wonderful! Soft and warm unagi (eel) on good rice! Mmmmmm!! There was nothing too salty or sour. I guess my taste buds were still messed up a little then and I couldn't taste sweetness as much as I usually do, but still I liked the dish. It was even better when I poured their light-tasting dashi broth (it came in a big pot) over this rice and eel topped with condiments, as they recommend on their website. This is the seafood version that mom ordered. 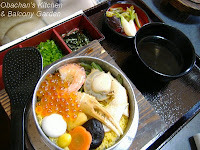 After eating most of the seafood toppings, she also poured the dashi broth over her rice and loved it so much. I think this kamameshi delivery was a great idea when I was craving for a good meal but going to a restaurant seemed too tiring. I truly enjoyed this meal in my room where I could relax the most. FYI-- These containers are of course not disposable. You are supposed to leave them right outside the entrance of your house, and the delivery guy will come back hours later and pick them up. You don't really have to wash the containers before returning them, but I guess many people wash them. Wow! Looks how much unagi you got! That would cost a fortune over here in Toronto (and probably wouldn't taste anywhere near as good as the one you got). I think that's so adorable. In the U.S., we probably wouldn't request that meal as a "fresh-out-of-the-hospital" diet. No, we probably wouldn't. Best wishes for a comfortable, healthy recovery. Welcome back! So glad you've made it through. Take it easy and be lazy. I love unagi don very much. My grandmother used to take to to a famous place in Shikoku where you had to reserve for weeks ahead! Your hospital meals look better than anything I've had in the hospitals here in USA. There is no food delivery here except pizza so I would have to have it brought in by family or friends. I;m glad to see you are on the way to recovery. I've been enjoying your blog for some time now, and just wanted to add my best wishes for a full and speedy recovery! I'd heard or read somewhere that hospitals in Japan often serve sashimi as the first solid meal post-surgery, because it's easily digestible. I guess that wasn't your experience, but is there any truth to that? Hi obachan, glad to see you back. Hope you have a fast recovery and take things easy. Welcome back, Obachan! We all wish you the best. I'd never heard of kamameshi before. How do kamameshi meals differ from nabe meals, except for the cooking utensil (metal pot instead of clay pot)? Oh my! I don't visit for a bit and then I come back to find Obachan has been in hospital! It sounds like your recovery is going well. I hope you're back to 100% soon! Actually the container is a little smaller than it looks in the photo and the unagi was just the topping, so it wasn’t a great amount of unagi. But yeah, I can imagine how expensive something like this can be over there. You’re right. :D Mmmm… I wonder what a typical “fresh-out-of-the-hospital” diet is over there. Thanks. It’s so nice to be back (and be able to type in front of my laptop without being terribly exhausted). Yeah, I think this unagi made a great contribution to my quick recovery. Thanks for your nice cooment. I’ve never heard of sashimi being the first solid meal after a surgery… I did find a couple of Japanese websites that say sashimi is more digestible than simmered fish, but I really doubt if Japanese hospital staff would choose it specifically as first solid meal post-surgery. Thank you. It’s great to be back. Basically kamameshi is a rice dish while nabe is usually meat/vegetables/seafood cooked in broth. Yeah, I was away from this blog for a while for my very first hospital stay and surgery experience. I guess I’m pretty close to 100% but there’s one thing I haven’t tried yet… I haven’t had any alcohol yet after the surgery. hi there, i found your blog googling something....i love this post! 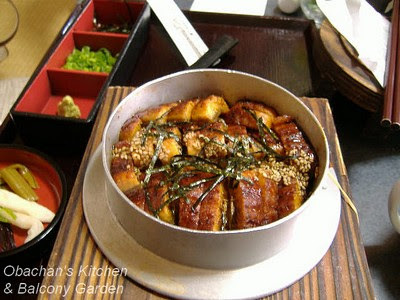 unagi is so delicious and i cant believe the delivery man comes to pick up the dishes after - it sounds heavenly! Thank you for your nice comment. Yep, I'm back to normal life now. I'm glad you're home and on the mend. Your posts about your hospital experience were especially fascinating, informative, and amusing (oddly enough). I'll have to stop by and read your sites more often.